The holidays can be a hectic and busy time. But they don’t need to be! 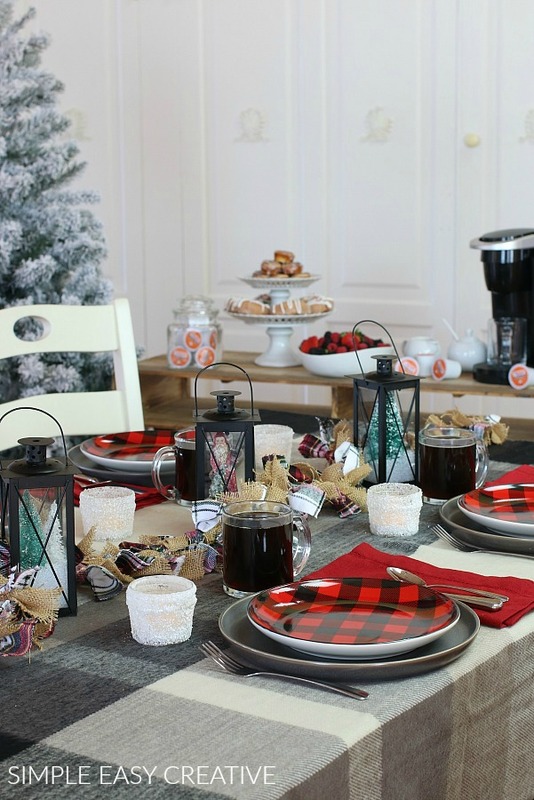 This Rustic Christmas Tablescape is cozy, simple to put together and takes a small amount of time. 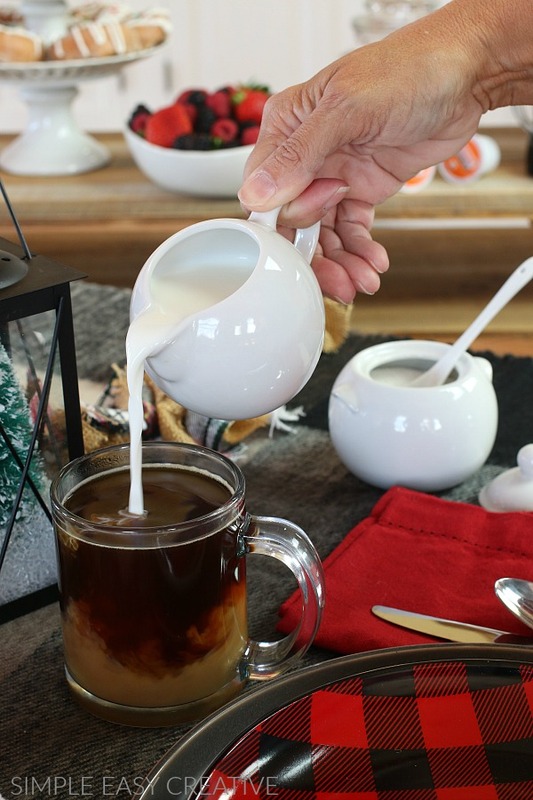 Christmas morning for our family is very traditional, we begin by opening presents as a family, each person takes turns opening a present and then while the rest of family cleans up all the wrapping paper and ribbons, I get breakfast ready. 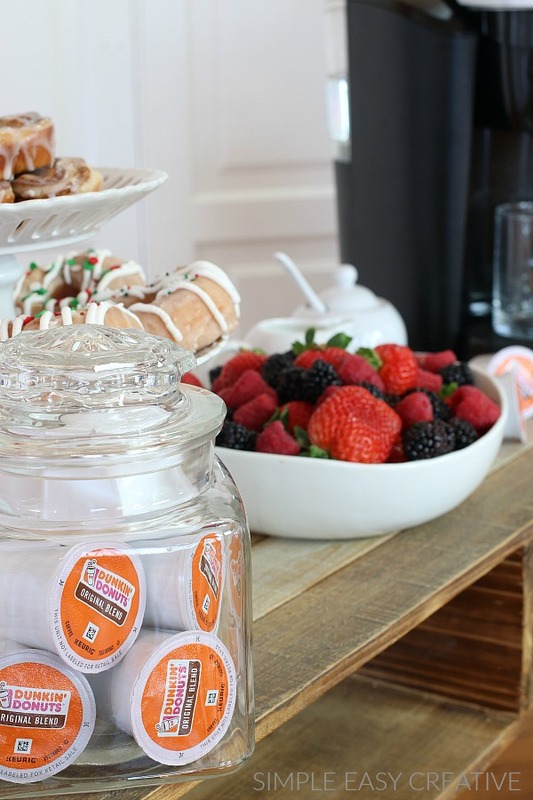 You can serve Dunkin’ Donuts® Original Blend, or add some of their other bakery and holiday flavors to the table and let everyone mix their favorite cup of coffee. You can find Dunkin’ Donuts at home coffee at your local Walmart or Walmart.com! The holidays are super busy, from shopping to parties, wrapping – stuffing the stockings to entertaining – keeping it simple, in my opinion, is key. And this Christmas table is a great example of that! Not only do I like keeping the table setting simple, the breakfast needs to be easy as well. Later in the day, we enjoy a traditional ham dinner with all the side dishes and desserts, so at breakfast it’s super easy. 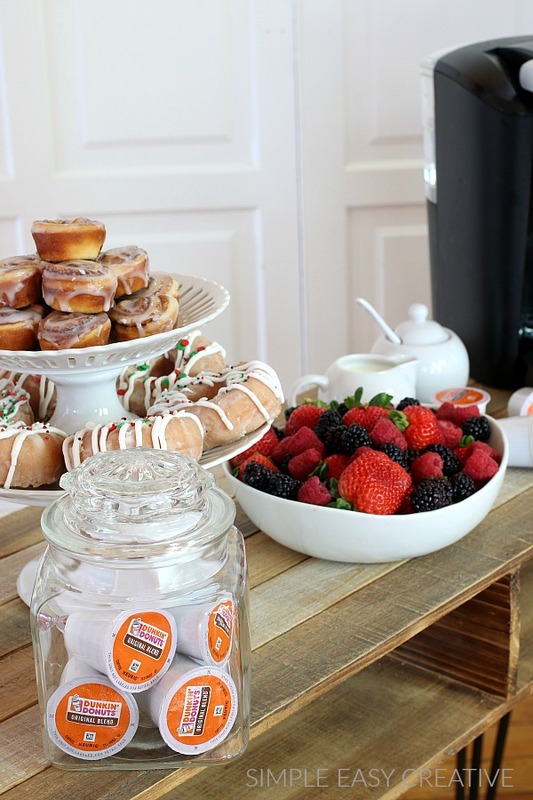 Store bought cinnamon rolls, doughnuts and fruit goes perfectly with a hot cup of coffee. I dressed up the doughnuts a little by drizzling them with frosting and adding sprinkles to make them more festive. 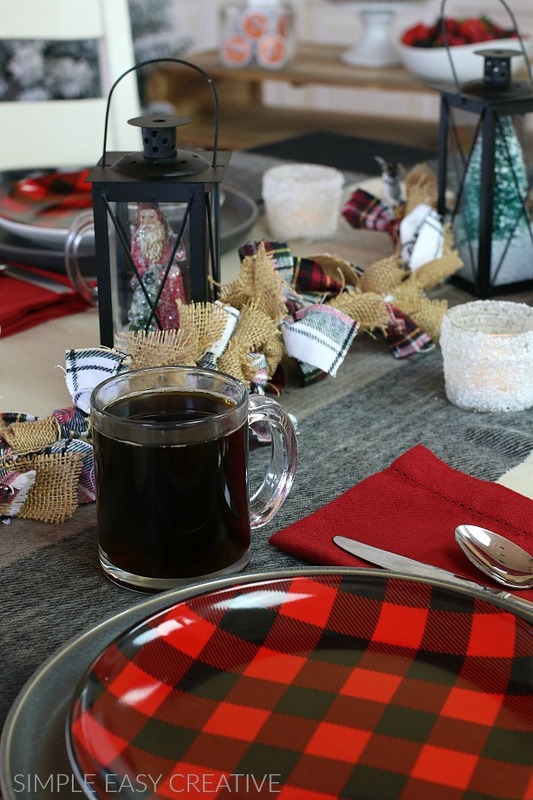 When setting the table, I like to think outside the box, so instead of a tablecloth, we started with a plaid flannel throw to make it cozy. Down the center of the table is a garland with pieces of burlap and plaid fabric, simply tied onto a piece of twine. For the centerpiece decorations, we used small black lanterns that were meant for candles, added decorative filler “snow” to the lantern and a Santa in one, and trees in the other two. The snow covered mason jars, are super easy to make by painting on decoupage glue and rolling it in Epsom salt. More salt is added to the bottom and then a flameless votive candle. Each place setting has a gray plate and then a buffalo check smaller plate to add some color and a festive feeling. 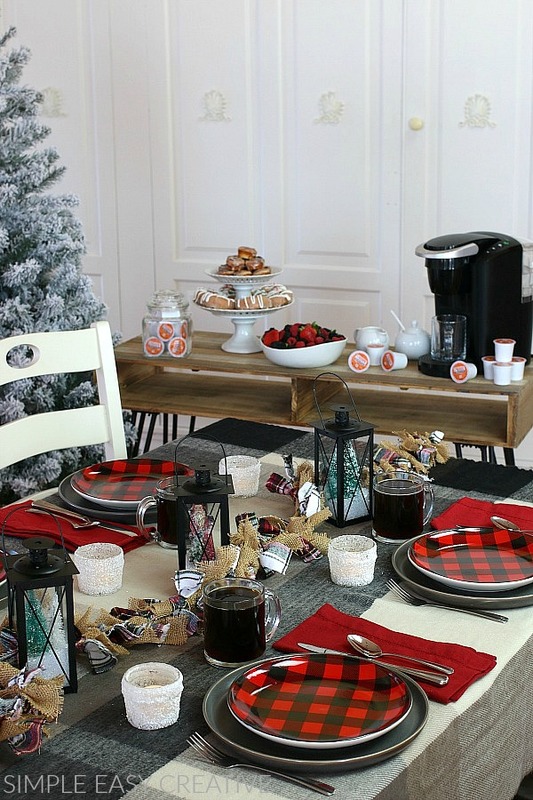 Napkins, silverware and coffee mugs finish off the Christmas Tablescape. I bet it would Erin! Thanks! LOVE this! This would be perfect for our farmhouse this Christmas, thanks for sharing! So excited you like it Kimberly! Thanks! I am totally crushing on those plates! You are so creative! Love this idea. Thank you Becky! It was really fun to put together! This is such a fun tablescape!! Thanks so much Aimee! So glad you like it!